Let me tell you something about The Biz. The Biz doesn’t have a great attention span when he’s preoccupied thinking about something else. Like when I was in labour all three times with our children. Miss 9 was 10 days overdue and Miss 8 was 4. Now when Miss 3 (AKA Princess Shithead) was born, I chose to be induced. I did not want to go any further than 4 days over. The Dr was ok with that and understood my frustration as it was the beginning of summer and was as big as a house. The big morning came and we were at the hospital for 6.30 am. I had a midwifery student watching over me(she got a call during my labour that she had passed her exams and was a fully qualified midwife. And Miss 3 was her first proper delivery), monitoring contractions, whilst The Biz kept leaving the room. He didn’t tell me why he was leaving the room and the midwives kept asking him if HE was ok. So during all three labours, I was abandoned in some kind of way. Husbands aren’t supposed to do that are they? . And WHY did The Biz keep leaving the room? The Biz had eaten something the night before that had given him the farts. Going through labour isn’t great at the best of times, let alone with a farting husband. 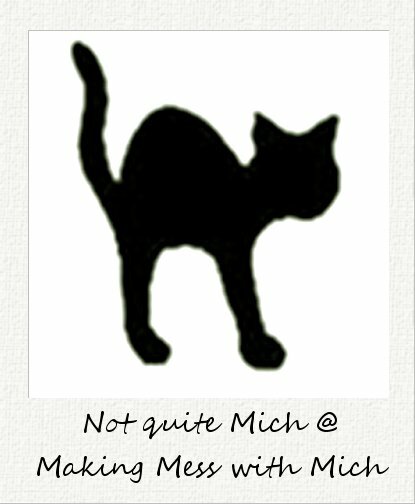 Mich is the newest blogger to grace the He Did What!? series with her blog, Making Mess with Mich created in April 2011. She's a SAHM to three beautiful girls and black cat called Pepper... who she is currently training to use the toilet instead of a kitty litter tray ala 'Meet the Parents'. Go check out how she's doing it - she has promised no photos of the 'success' so it's quite safe - and then check her out on Twitter. LOL! I'd almost call that a gentlemanly act in any other circumstance! Oh my! I would have thanked him, farting hubbies are no good to anyone. It was not the nicest of circumstances, with Miss 10 he was preoccupied with a video game and when i was in labour with Miss 8, he was too busy watching the news as the war in Iraq had just started. I give him points for leaving the room and not trying to blame it on something else. Or on you. He was in a lose lose situation - frankly I'd have have just got on with it - but then I'm not entirely known for being a gentleman! !